The Chairman of the Republican National Committee has a message for Wisconsin&apos;s GOP, get on board with change. 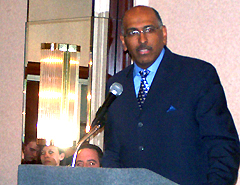 RNC Chair Michael Steele says he&apos;s got reporters curious. "We&apos;re changing the debate, we&apos;re changing the discussion about the party," says Steele. Steele has been dealing with internal strife and some questioning his leadership since taking over as chair three months ago. Steele says his job is to "take the party to the next level," and adds he&apos;s beat Democrats in fundraising this first quarter. The RNC head made it very clear that Republicans who waste time whining and complaining can follow "Arlen (Specter) right out the door." Although several people have thrown their hat in gubernatorial run, when Steele mentioned the race for Governor the crowd immediately began yelling "Walker!" Steele cracked a few jokes and waved to the Milwaukee County Exec who obviously had a number of fans in the room. State GOP Chairman Reince Priebus has been helping Steele in his transition. So much lately that Steele calls himself an honorary Wisconsinite.